Discussion in 'Audio Hardware' started by Benzion, Jun 24, 2017. After poo-pooing conical tip stylus for years, I'm REALLY enjoying listening to the Shure M35X and the M97Xe with .6 mil. conical tips. I'm looking forward to trying conicals on my V-15 Type III and V-15 type IV. There's a great inexpensive conical for the larger opening Shure cartridges under the Fidelitone brand on ebay. They are new issue. Packages can be faulted for being deceptive, but the price isn't. It used to say N97E on it, or something, but the seller later changed it to the conical designation, "B," I think. cjc and McLover like this. Yes, I have the N97B on my M97Xe and it is a real nice sounding conical stylus. Can't wait to try conicals on the V-15III/IV. Compared to the prices of used or NOS V15 carts though, $365 total for a new production cart with that sound and tracking ability is still a great deal. Except no one is making a replacement stylus with a Beryllium shaft anymore, NOS left is shooting up in price for the JICO SAS. So you’re saying the beryllium shaft is responsible for the sound? It is a good part of it. Especially considering the new JICO replacement stylus have either a sapphire cantilever or tapered ruby cantilever. Vastly different from the beryllium. The basic upshot is that if you keep the tube mass the same, and make it larger in diameter and reduce the wall thickness the stiffness improves significantly. Basically the stiffness is a (distance)^4 thing. I've worked out the formulas that Shure used (basically the stiffness of rods and tubes), and get the same performance figures (Shure called it "Shank Performance Ratio") as are set out in the patent and the V15V instruction manual. So going from a 10mil (0.25mm) rod to an 18mil (0.46mm) tube with a 0.5mil (12.7 microns) wall you get approximately a 6x improvement in stiffness. When you add the 6x increase in specific modulus going from Aluminium to Beryllium, and you get a massive benefit from Shure's, alas now lost, thin wall Beryllium technology. Most cantilevers are now boron, sapphire, ruby or diamond solid rods, and are actually less stiff than Shure's Beryllium thin wall tubes. googlymoogly, Benzion, JohnO and 5 others like this. Benzion and Just Walking like this. And Shure delivered this technological marvel for a very fair price. That's the real miracle. Yes - too true. It is a crying shame that they lost faith in vinyl, given the resurgence in the medium. Most high end moving coil cartridges seem to use Boron rods 0.3mm diameter (11.8mil). Even given the greater specific modulus, the Shure beryllium cantilever was 3.8 times greater in stiffness/effective mass ratio (assuming the same length). Which essentially means that the cantilever resonance frequency is (root 3.8) = 1.9 times higher than a current state of the art boron cantilever. googlymoogly and Benzion like this. Yes, me too. That's the first cartridge that came to mind when you first started posting your very mathematical observations. There's actually one with a channel out on ebay right now, and another one with good channels and a missing cantilever. I've really been trying not to buy both of them and attempt a transplant. Scored a yrad sale Sansui Automatic Turntable today and it is sporting a V15 Type IV with a bent stylus on it. What is the best avenue for sourcing a replacement stylus? I have my eye on one as well. macster and Guitarded like this. The details of SAS series are below. We’re grateful if you would choose your favorite one which is suitable on your taste. However other 3 SAS stylus are not. However the specific date to take SAS order again is undecided. We’ll inform you when SAS stylus will be available on JICO Web Shop. We hope this information will be helpful for you. If only my budget would allow me to buy one of each! Undeniable cartridge and aftermarket high-end stylus options exist. Try this one and smile all the way to the bank. Yet another hit on my bank account ... thanks. I think. I have two V15V-MR's. One is now fitted with a JICO SAS/Boron. I do not perceive that these carts sound different, much less that one is better, in any manner that better can be discerned. Since I believe these carts get all there is in the groove to get and a tone that seems just right, I no longer have an appetite to spend money on additional carts in pursuit of greater listening pleasure. I use a III series. I have two V15 III's and one V15 IV. All are equipped with a Jico SAS with boron cantilevers. No more searching for vinyl Nirvana. oregonalex, Sterling1 and macster like this. Can recommend the V15IV with the little brush. Keeps the LP clean during the spinning. Sound is extraordinary good for all kinds of mudsic. macster and SandAndGlass like this. I'm using a traditional boron SAS with my Shure V15 IV. I have an interest in cartridges that have a legendary reputation and lots of aftermarket improvements. I already own and love a Denon 103R, modified by Zu Audio. 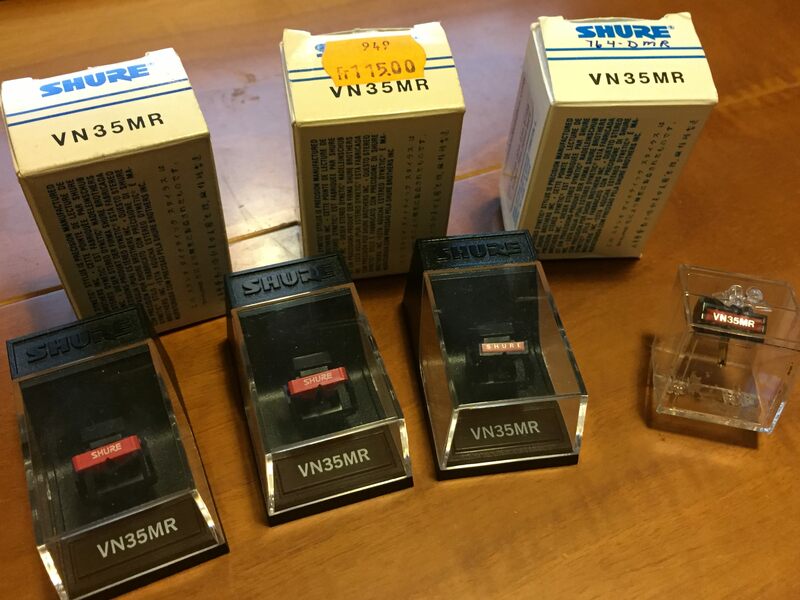 Next, I'm thinking of getting the legendary Shure V15. But, a) - there are too many to consider, and I don't know which one to get, and, b) - the NOS ones are quite expensive, easily in the $500 range. Are Type III better than Type IV or vice versa? Are hyper-elliptical styli better than elliptical? Are these prices justified by the merits of the carts, or is it just hype/vintage markup? If the advise is NOS - which one? Is the combination of current production Shure M97xE with an upgraded stylus (LP Gear N97xVL ViVid Line or JICO SAS/sapphire cantilever) better, or at least as good as those NOS carts? - It seems this route is cheaper than original NOS cart, even with JICO, but is it a better choice? The turntable the cart is likely to be installed on would be a Denon DP-1800 direct drive, with original arm. Separate thread on the merits of the Denon will be posted shortly. You will lilely find little to no difference in sound qualty from the V15 III, IV, or V cartridge bodies. IMO any perceived improvement in s0und quality of the IV or V is due more to stylus profile than anything else. Get a V15 III and equip it with a Jico SAS and IMO you'll have the same SQ as a V15 VMR. Pretty sure if you could dissect a III, IV, or V you would find the internals to be identical. I have a V15 III, IV, and V which are all equipped with the Jico SAS and hear no differences at all.